Do you like coffee? How about cappuccino? You know, with the frothy milk and all that. This one’s for you. I have officially been blogging for two years now. No kidding, October 29th was when I set this site up. Woo hoo!! I’ll drink to that. Wine would be nice, but more likely coffee. Houston and much of the south is COLD this week–no kidding, we’ve had a freeze warning. VERY unusual to be this cold this early in the season, but I’m happy. I think the cat’s happy, but I’m not sure. 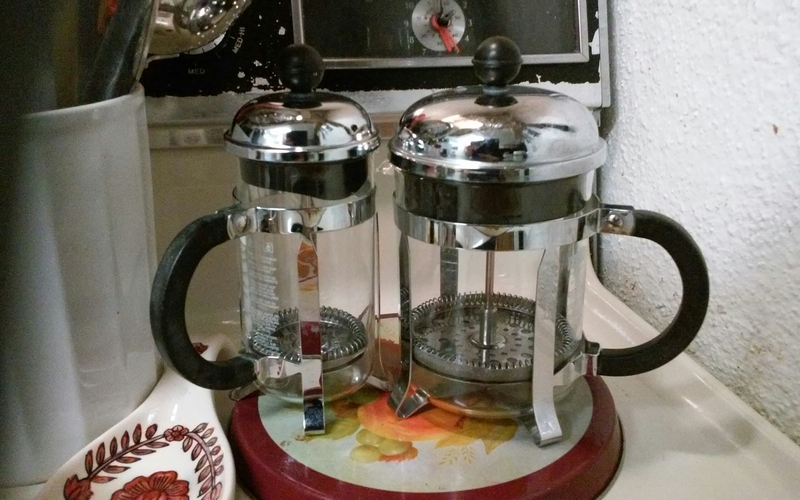 What a great time to make some coffee, tea, or hot chocolate! Let’s concentrate on coffee this time. Last year my decade-old cappuccino machine finally died, and I bought another one. 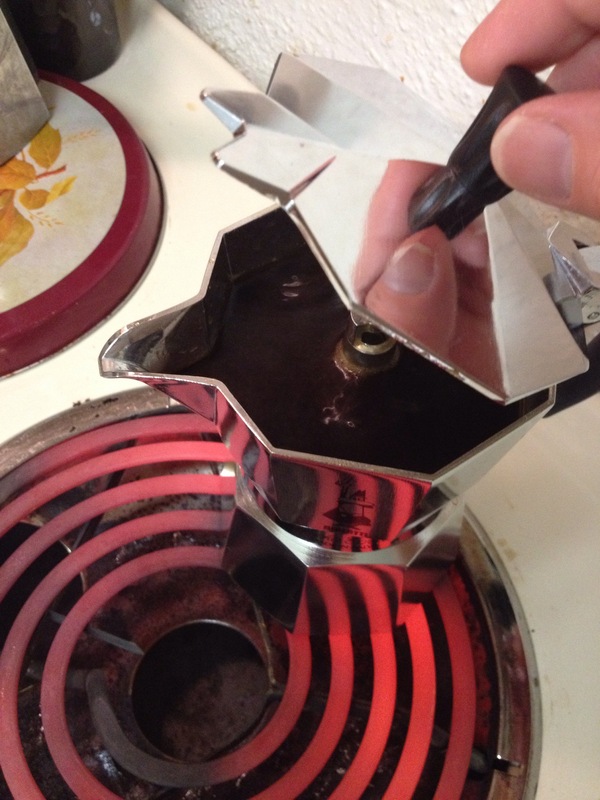 As I mentioned in a recent post, I went through the process of finding replacement parts for an old Bialetti stovetop espresso maker the GER gave me many years ago when we were dating. However, Nick Usborne at Coffee Detective talking about how to make it quickly and easily on top the stove with a Bialetti. I just never knew it was this easy, so. . .I’m doing it. Anybody want a Krups cappuccino maker? Hardly used, a year old. . . .
Nick also talks about something that many of my copywriter friends are hooked on, Bulletproof Coffee. I’ve also seen it called “Butter Coffee.” While I’m not a doctor, nurse or other scientific/medical professional, I don’t believe you will be able to repel bullets like Superman when you drink it. Just a thought. Friend of the blog AK (who made my recent birthday quite happy) swears by it, talking about brain power and amazing feats of thinking. I think it’s the caffeine, to be honest, but she’s a terrific lady, so I don’t say nothin’. You can read more about it on Facebook, and their official site is here. No, I’m not interested. Sounds really weird, even for me. Fortunately, Nick The Coffee Detective has tried it too. He wasn’t exactly tap-dancing, either. Maybe another day. That Octane stuff is more expensive than butter. 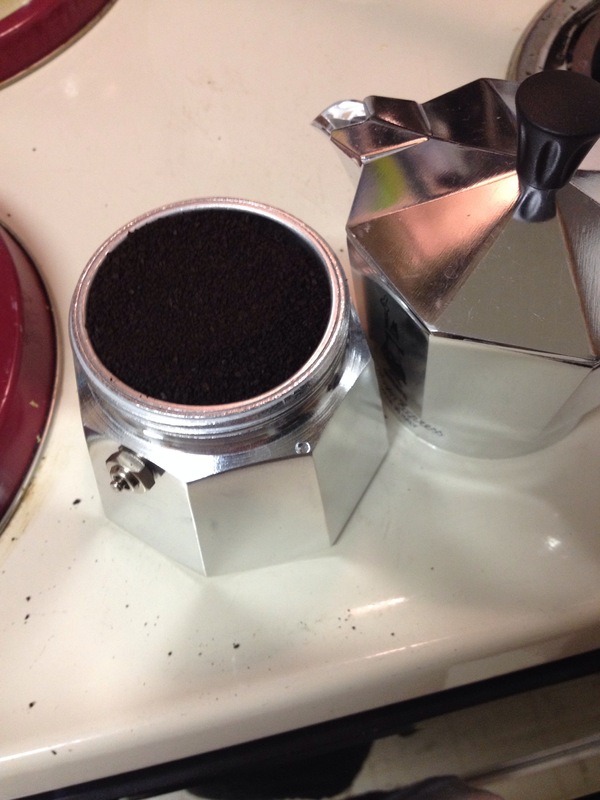 Speaking of coffee, I also got my Bialetti issues straightened out. The one with blue roses is a 6-cupper, and I’ve returned all the spare parts to their sellers. Done. 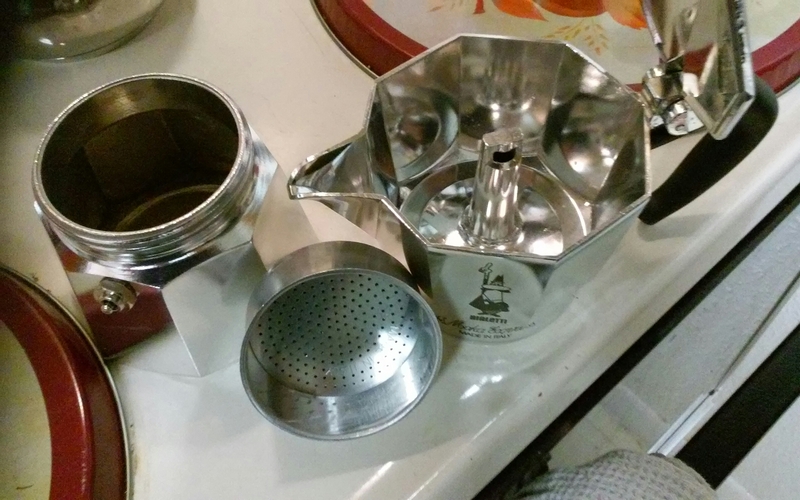 I’ve used it as well as a very small one now that I have sources for decaf espresso. Can you believe it? Starbucks and HEB. No kidding, get it anytime. DUH. Starbucks, as I’ve mentioned, offers a free treat on your birthday with a registered Starbucks card (and app, if you want.) Also offered was 15% off (I think) on anything ordered from the Starbucks store. So. . .I took advantage of it. While they have a wide range of great drinkware, that 16-ounce travel tumbler was also on sale, and I’m really glad I got it–I’ve put both coffee and tea in it this week and it stays warm a few hours. Not bad, and would work great on a long commute. . .I’m sure someone already figured that one out. You can put these in the dishwasher, but the glass can break. However, you can re-order the beakers at Bodum’s website. Yes, I know, more spare parts. 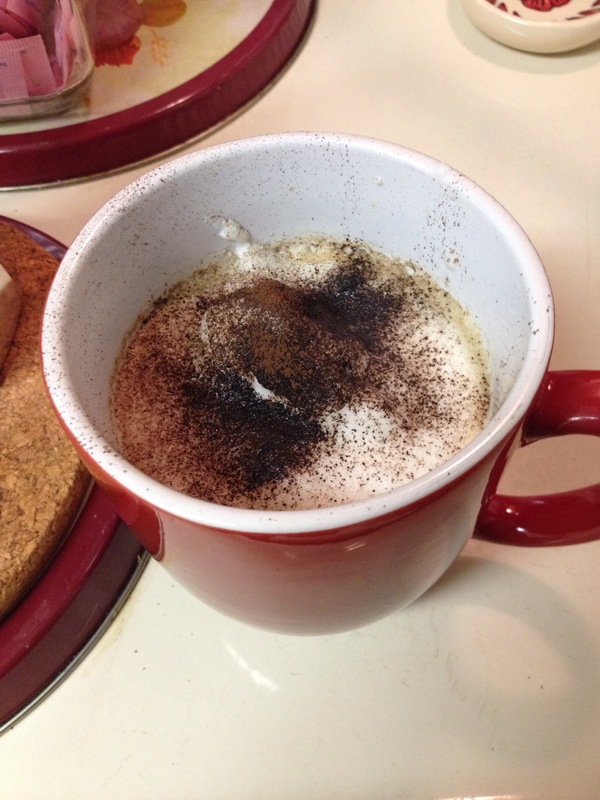 Now, I like cappuccino better–who wouldn’t?–but it’s more expensive to buy and a bit more trouble to make. But since reading Nick’s article, well, I wanted to, so I did. 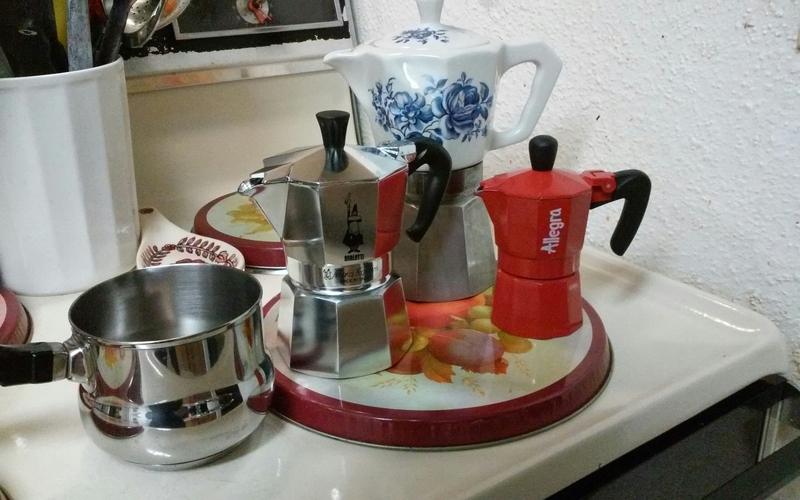 However, I had two of those ubiquitous Bialettis in my possession–a cute little red one cup and the retrofitted antique six cup. 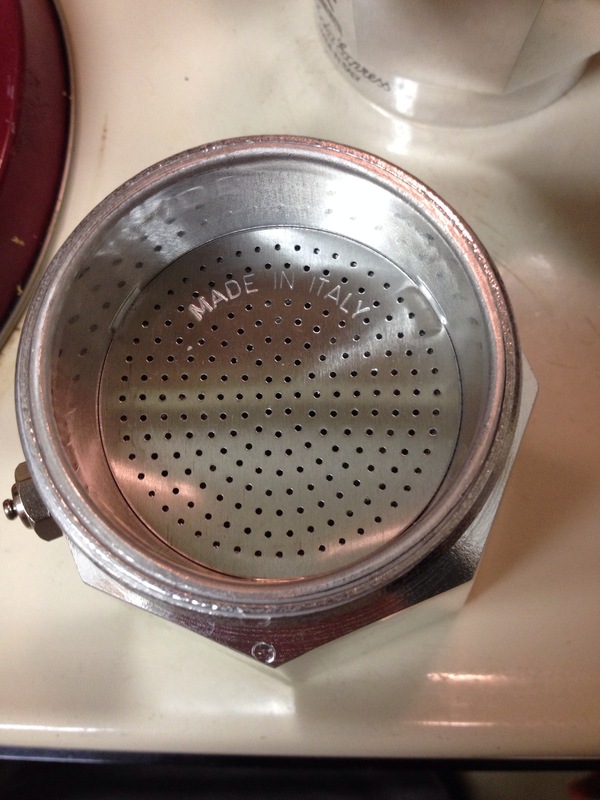 Armed with a coupon, I made my way to Bed Bad, & Beyond and got a 3-cup model. Now, like everything else, I’ve got multiples. Any wonder why I need a bigger place? The little red one was just so cute. 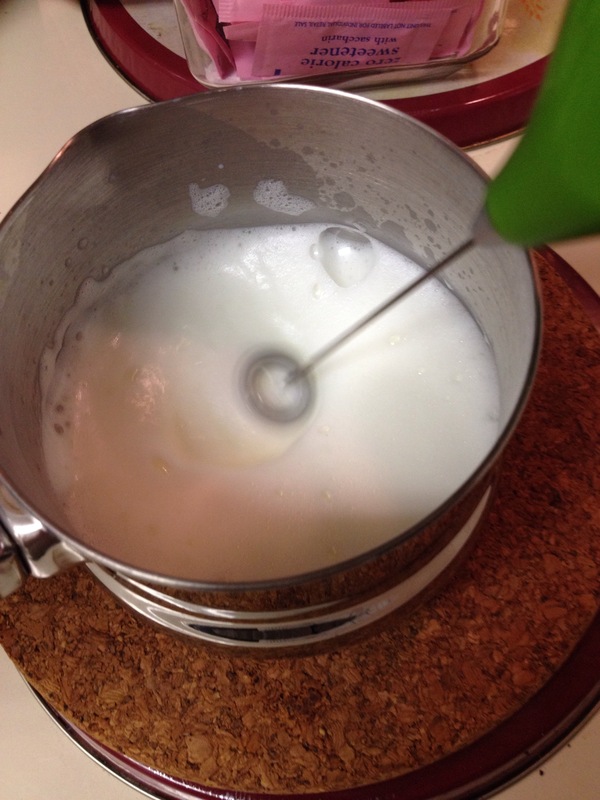 Also purchased with the 3-cup pot is a butter warmer to heat the milk. Just like Nick! So I now I do it in my own kitchen, just like Nick! Ready to do this on your own? Screw the top back on and turn on the heat. My suggestion is to have a cork trivet or some other place to put hot pots down in between stages. Put your sugar/sweetener/flavorings in the bottom of the cup first. 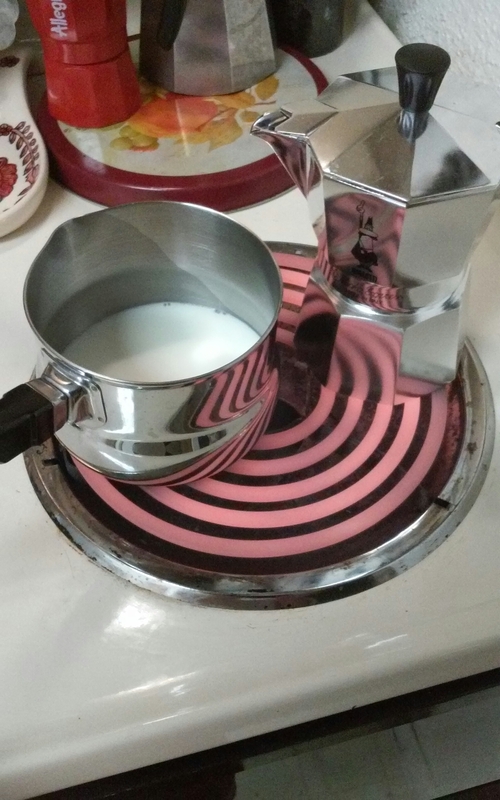 Using a big spoon to hold back the froth, pour the liquid milk into the cup first, then the espresso, then dump the froth on top. Since I only have two hands, I can’t show you that part! Yes, this is what you pay upwards of $5 a cup for in coffee shops like Starbucks. Look, there’s labor involved, plus it costs money to set up those great locations, so understand that part. But if you really, really like the frothy milk and all that, or the smooth tastes of lattes, it’s nice to be able to do it at home and enjoy it whenever you want. Let me reiterate that decaf coffee is great in the modern age. If you’re being told to cut down the caffeine, or you realize you have a problem, don’t think your future is with Sanka. 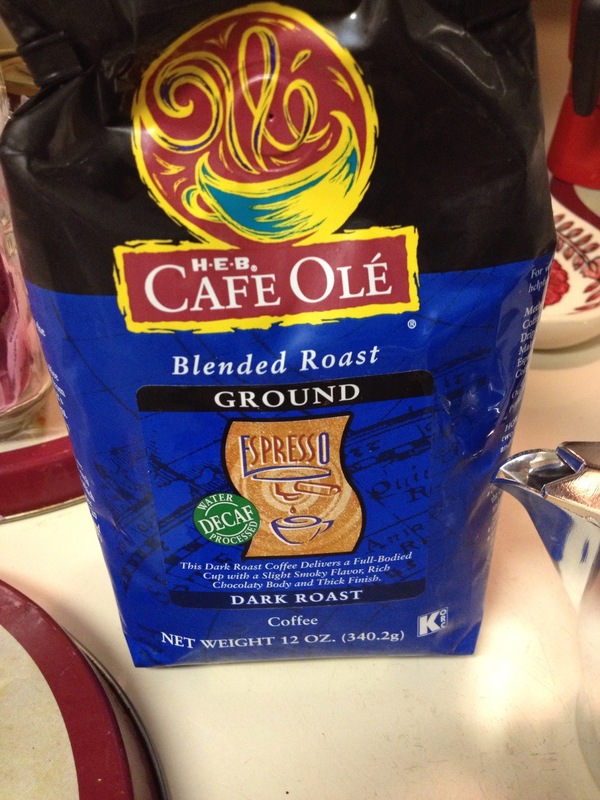 Lots of great decaf is there for the sampling, so go find your favorites. 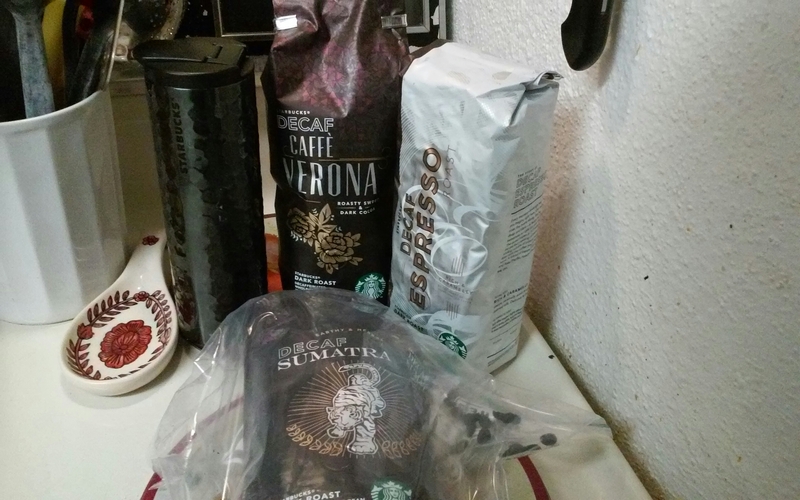 Mine are Sumatra, Kenya AA, and. . .anything with chocolate and raspberry in it. So get brewing, and bake something delicious to go with your cappuccino or latte while it’s cold enough to put on the oven, too.